Are you a farmer looking for a little media attention? Has the price of wheat collapsed and you're looking for a way to avoid the bank foreclosing? Never fear, AgroArts is here! Choose one of our popular classic designs or provide your own. We'll stealthily create any crop circle, any night of the week, to your exacting specifications. Hey spoiled rich kids: custom crop circles make a great gag gift. Impress the babes or just embarass your old man on the helicopter ride out to the country estate. Whatever your needs, AgroArts can alter space-time to provide a mysterious, yet pleasing work of botanical art. 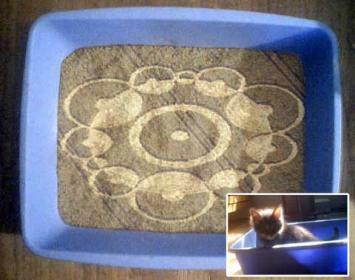 Why are the crop circles in a litter box?